If carrots are good for your eyes, than carrot cake must be even better . . . right!?! 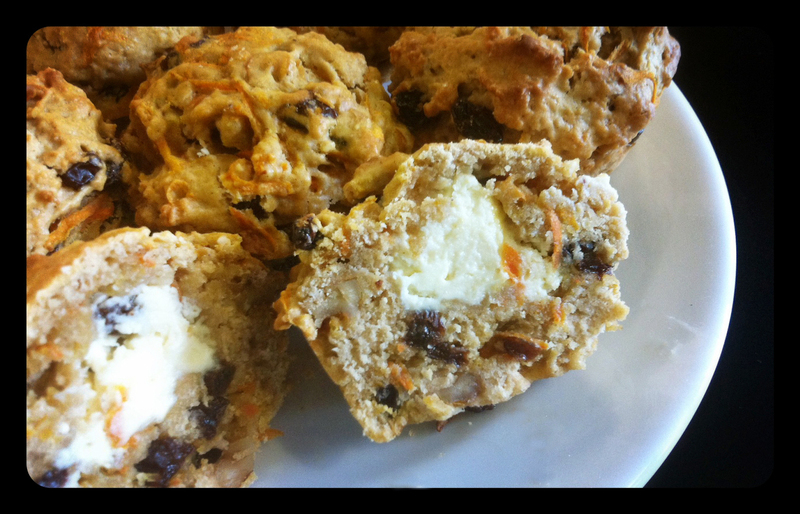 These little Carrot Cake Muffins with Cream Cheese Center, from The Curvy Carrot, make a yummy breakfast, lunch time treat, or afternoon snack. They were super quick to put together this morning, and with carrots, raisins, and walnuts, they have to at least be a little bit healthy for you (just ignore all the sugar). Carrots have been used in sweet cakes since medieval times when sweeteners were scarce and expensive. Carrots, which contain more sugar than any other vegetable besides the sugar beet, were much easier to find and less expensive. Similarly, during World War II, the popularity of carrot cake was revived in Britain because of rationing. Carrot cakes first became commonly available as a novelty item in restaurants and cafeterias in the United States in the early 1960s. People liked them so much, that soon carrot cake became a standard desert in restaurants. Line a cupcake pan with paper liners or brush with melted butter. For the filling: In a microwave-safe bowl, microwave the cream cheese on low power until softened, about 40 seconds. Add the granulated sugar and almond extract to the cream cheese mixture, mixing well, and set aside. For the muffins: In a medium-sized bowl, whisk together the flour, sugars, baking powder, cinnamon, ginger, and salt. combined. Then, fold in the grated carrots, walnuts, and raisins. Drop about 2 tablespoons of the muffin batter into each muffin cup, making sure to completely cover the bottom. Using another tablespoon, drop 1 tablespoon of the cream cheese mixture onto the center of each muffin cup. To complete the muffins, cover each dollop of cream cheese completely with the remaining muffin batter. It is helpful to wet your fingertips a little bit to spread the batter evenly and thoroughly over the tops of each muffin. Bake the muffins until a cake tester inserted into the center of a muffin comes out clean, about 20 minutes. Transfer the muffins to a wire rack to cool. Today I realized with shock that I had not done any baking for you yet . . . so to celebrate making it through Week 1 of the 100 Days Project, I made these lovely Wholewheat and Millet Muffins. The recipe comes from Heidi Swanson’s amazing cookbook Super Natural Everyday, that specializes in teaching people how to use veggies, grains, and pulses in ways that will get the most out of the ingredient’s nutritional value. Plus, all the recipes tend to be quite yummy. Wholewheat flour is a robust, full-flavored flour containing vitamins, minerals and protein. Whole-grain whole wheat flour is more nutritious than refined white flour, and it is a good source of calcium, iron, fiber, and other minerals like selenium. Millets are a group of small-seeded grasses, which are a major food source in arid and semiarid regions of the world and feature in the traditional cuisine of many others. This grain is starchy, high in fiber, has a protein content comparable to wheat or maize (corn), is relatively rich in iron and phosphorus, and the bran layers of millets are a good source of B-complex vitamins, calcium, iron, potassium, magnesium, and zinc. Millets contain no gluten, so they can be eaten by those people who have celiac disease, and make an excellent substitute for oats in porridge. 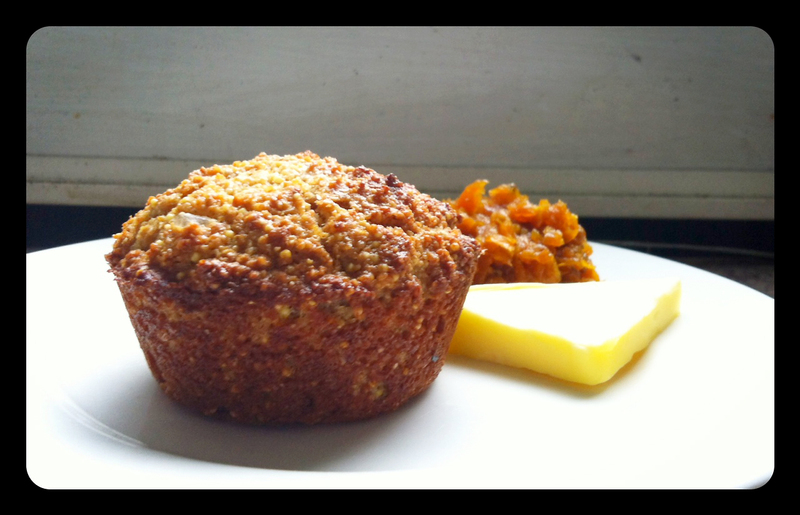 These muffins came out full of rich hearty wholewheat flavor and make a great breakfast treat slathered in butter, or with the Mediterranean Carrot Relish from my Day 7 post. Preheat oven to 400 F /205 C, with a rack int he top third of the oven. Butter a standard 12-cup muffin pan or line with paper liners. Whisk together flour, millet, baking powder, baking soda, and salt in a large bowl. In another bowl whisk together the yogurt, eggs, butter, honey, lemon zest, and lemon juice until smooth. Add the wet ingredients to the dry ingredients and stir until flour is just incorporated. Divide the batter into the muffin cups filling each cup until just below the rim. Bake for about 15 min, until muffin tops are brown and just beginning to crack. Let cool for 5 minutes in the pan, then turn the muffins out of the pan to cool completely on a wire rack.